In May 2009 I was made redundant. I suspect many of you readers will already know this and it’s no secret that I started writing this blog and running my supper club as something fun to do while searching for a job. What you may not know are the realities of living on a suddenly reduced income. Within six months I dropped from a very cosy salary of £30,000 a year as a health psychologist, to £72.40 a week income based job seekers allowance (once the redundancy money and ad hoc freelance work dried up). This was before my marriage ended and my husband and I still lived together. He was working full-time and had a similar wage, which should be pretty good, but once you factor in all the trappings of the ‘middle-class’ professional lifestyle; hefty mortgage which he had to take over paying, credit card payments, household bills plus two hefty overdrafts (which we could no longer afford to pay off), the descent into debt and virtual poverty was swift. This is how people end up bankrupt and homeless. At one point my monthly bank charges topped £150 because I couldn’t pay in enough money to cut my overdraft. The wonderful HSBC bank refused to freeze the account, or stop charging me, which compounded my woe month on month. Advisors from the CAB told us the only way to freeze charges and cut payments was to default (except the mortgage, council tax and utilities). They told us that store card companies couldn’t make us pay and couldn’t send around bailiffs. Luckily we didn’t lose the house, we kept paying the essentials but we did default. It was stressful and we still struggled to keep our heads above water, often not having enough money to put fuel in the car or buy food for the family. It was scary how all that could happen. I have a PhD, but I couldn’t get a job. I was skint. I now have a terrible credit rating, but have learned what is important in life, what I can live without and just how precarious that capitalist lifestyle is. I joined forces with my friend Sophie who was in similarly dire straights. Sophie relied on the tried and tested student practise of ‘skipping’ as a way to top up her food cupboards. Skipping, for those not aware, is where people collect discarded supermarket food from the skips and use it to feed themselves. Technically its illegal (although not as immoral as chucking away perfectly good food or throwing bleach or rat poison over the contents of the skips so people can’t raid them and use the food…which happened in my area) and many supermarkets now keep their ‘discarded’ food under lock and key. Of course this makes it incredibly difficult to make use of the rejected goods, 90% of which is perfectly edible, safe and reusable. With food banks, foodcycle, and soup kitchens on the increase, it’s not just those on benefits who are struggling to feed their family. Barnardos reports that there are around 3.5 million children living in poverty in the UK (almost a third of all children) with 1.6 million in severe poverty . In the UK 63% of children living in poverty are in a family where someone works. There is a massive discrepancy in income, living conditions, outlook, perceptions, and I have lived this myself. But it’s not just about food poverty, it’s about the relentlessly wasteful planet we now inhabit, the supermarket controlled world that has drained people of their cash (don’t kid yourself, everything is over priced, even those things they tell you are on ‘special offer’, you only need to take a trip to Aldi or Lidl to see that) and their common sense when it comes to buying food. This has long been one of my favourite soap-box subjects and food rants (along with no cookery in schools), but I’m not the only one banging this particular drum, enter The Real Junk Food Project. According to their figures around 1.3 billion tons of food gets thrown away globally each year. This amounts to nearly 40% of global production. 40%!!! That’s huge. Unimaginable. In the UK alone we waste around 15 million tons of food a year and this is predominantly due to stringent and confusing food safety legislation. The Real Junk Food Project began life in February 2013 in Melbourne, Australia. Founders and co-directors Adam Smith and Johanna Hewitt were horrified by the amount of food waste they came across so set up pay-by-the-minute barbeques on the banks of the River Yarrow using discarded food. Later, when parenthood beckoned, they felt the lure to return home and back to Adam’s home town of Leeds with the aim of continuing the project. They hunted about, found lots of support and were finally offered access to a struggling community kitchen in Armley, a particularly deprived part of Leeds. Meanwhile, at a local food activist meeting Sam and Conor (co-directors to-be) heard about the project. They too were making their own discoveries about commercial food waste as they, and a cohort of other friends from university dined on the proceeds of supermarket bin raids. They heard about the project and approached Adam and Jo with food to exchange and a relationship was formed. 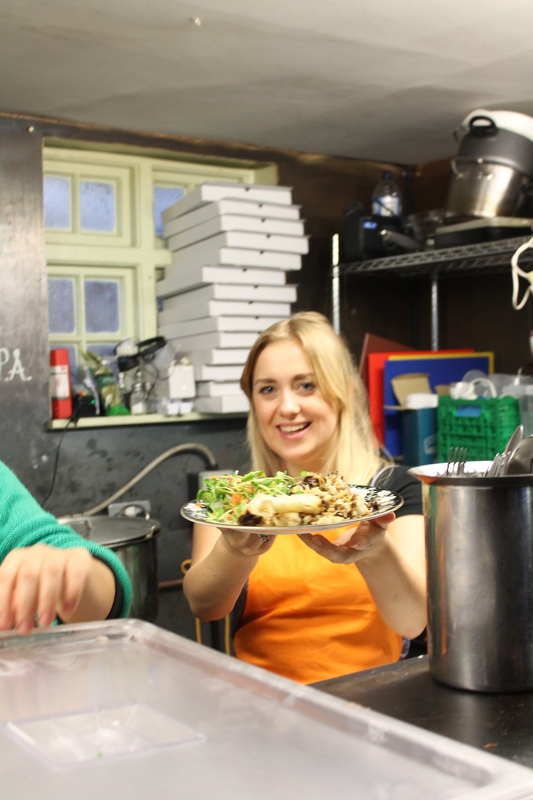 The Leeds Skipchen opened its doors for its first trial in December 2013 when the couple cooked Christmas dinner for the homeless population of Leeds. In the same month it became a Community Interest Company and has thrived and grown since sparking support and interest from all sectors. Now open 7 days a week the project is spreading and growing; new cafe’s are popping up across Leeds…and now, this, the first one in Bristol. The other interesting feature of the Skipchen is the Pay-as-you-feel (PAYF) policy. This is what their website says about it. I couldn’t have put it any better, so over to them…. 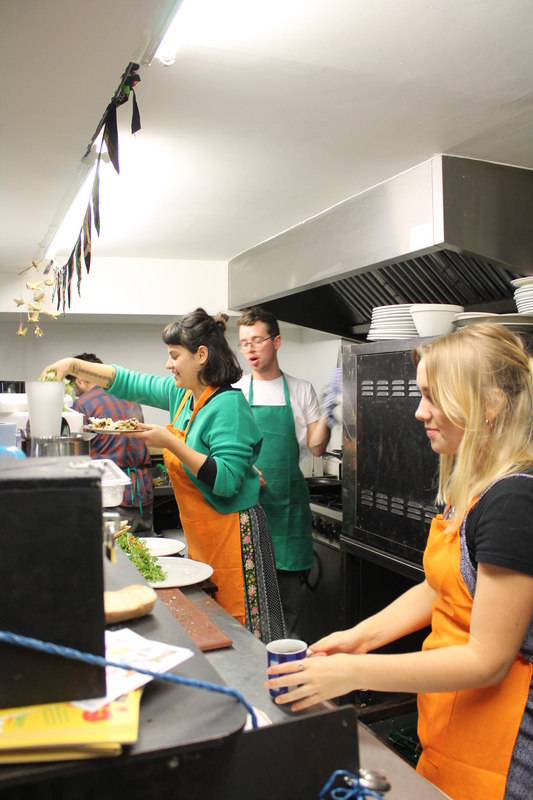 As well as the positive environmental impacts of reducing edible food waste the project also has clear social benefits through operating a strictly Pay-as-you-feel (PAYF) policy . PAYF offers an alternative to the conventional the payment system as there is no price on any produce of the café. Our system transcends monetary transactions and liberates people to use their skills and attributes as well as money to pay for their meals. Furthermore, we aim to highlight the absurdity that the produce we use has been stripped of its monetary value but still retains its nutritional value. By making people think about what they wish to contribute for their meals, the idea is to get society thinking about how they value food as a resource. The pay-as-you-feel policy makes sense and takes me back to the early days of supper club, when we asked for donations. Later, this later changed to ‘suggested’ donations because people needed more guidance, they wanted to know ‘how much’ was OK. Although the supper club is based on a different concept (I was buying top quality ingredients for those evenings which was in fact pretty much the only time I did any proper shopping) and costs had to be covered, it was still a not for profit exercise. I liked being able to offer people a restaurant experience without charging the earth, bringing in customers that wouldn’t normally go to a top flight restaurant, making them feel welcome and relaxed, where hippies with dreadlocks could sit next to university lecturers and all would get on and find common ground. So, on a damp Wednesday afternoon five of us plus a baby in a pram jostled for space and a place to sit inside the busy Bristol Skipchen. 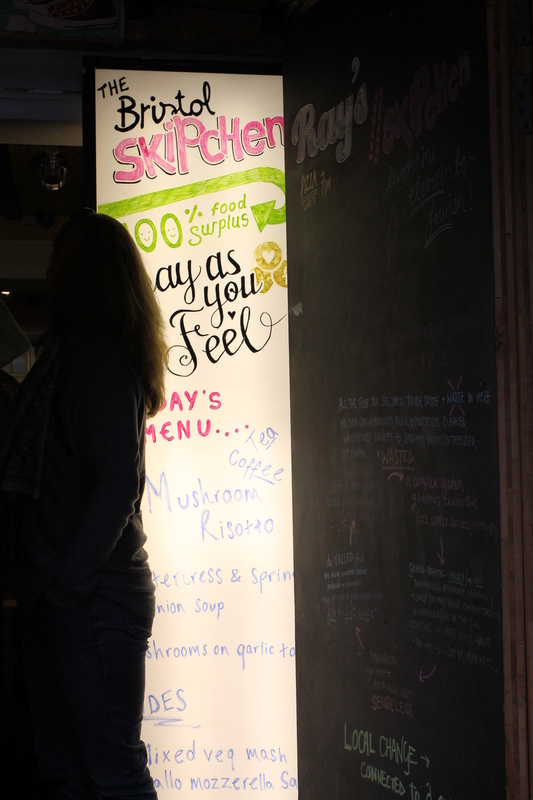 Initially we dithered, confused, trying to work out what was the skipchen cafe menu and what belonged to the bar that ‘loans’ them space during the day. 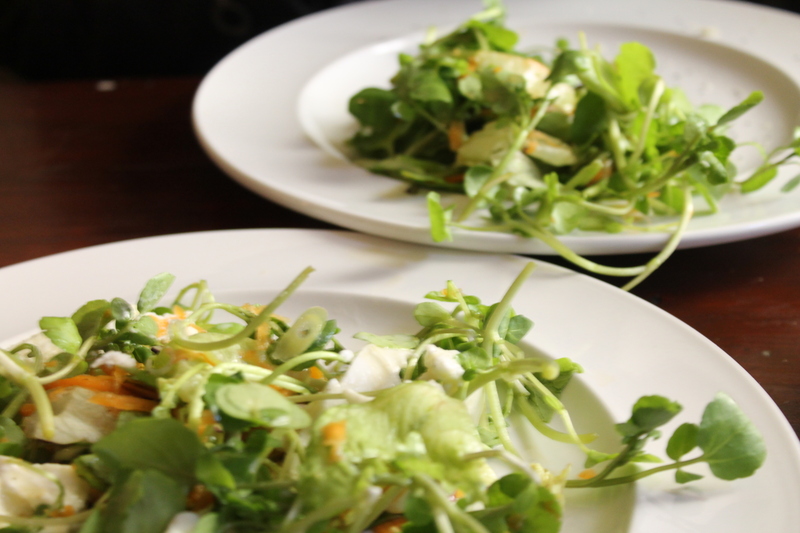 Once we’d sussed it out we chose a variety of dishes; vegeburgers, salad with mozzarella and a lovely lime dressing, watercress and spring onion soup, roast cauliflower. The cafe was happily chaotic with a vibrant group of diners leaving the counter with loaded plates of everything. I guess that for some this may well be their main, or only meal of the day. Conversation about the project surrounded us, and there seemed to be a keen interest locally. I spoke to Sam who runs the Bristol Skipchen and he told me how it worked. He emphasised two points; first that the project is independent of the big supermarkets. Food Cycle and many food banks, are run in conjunction with, or hosted by supermarkets…ironic since they are the ones that create the problems in the first place. By staying free of their input its easier to challenge their stranglehold. Second, it deliberately avoids the supermarket skips around Bristol which are already used by many of the cities homeless population. Food donations come from a variety of sources; a local homeless hostel that receives a surplus, a restaurant that over ordered mozzarella, a food PR company that couldn’t use a whole box of watercress, and is sometimes topped up with discards collected from skips in more affluent areas outside of Bristol, where the food would simply be thrown away. 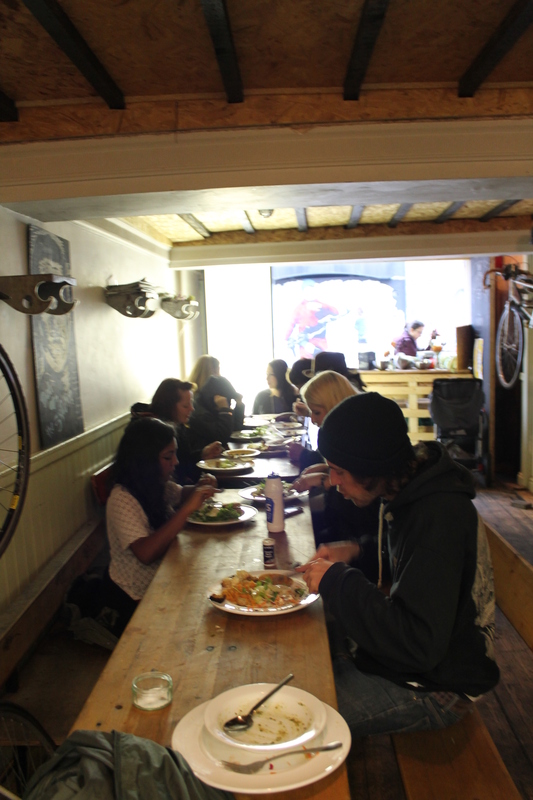 Bristol Skipchen is run by volunteers, all young, enthusiastic and committed food activists and has a lets all-muck-in-and-help-yourself kind of feel to it, which is what they hope to encourage. I love that the Pay As You Feel policy got us all talking, discussing what we’d eaten, what we thought the food was worth, weighing up the time and skill put into its preparation, using our judgement and what we could afford (my visit took place whilst on a severely pared down budget). Some visitors there can’t afford anything, and in that way its fantastic for providing a square meal. We could afford to pay, so did so according to our means. We loved it; the concept, the buzz, the enthusiasm and the commitment. It was good to see it busy. The food was pretty good, if not cooked with total gastronomic expertise (sorry, I’m a chef and hard to please 100%) and there was plenty of it. One of our group was my eleven year old son. Initially bewildered and perhaps slightly disgusted by the concept of eating food reclaimed from bins, he soon understood what it was all about, realised that I’d given him reclaimed food at home and so tucked into his lunch with no more hesitation. We were sad that there was no pudding, but they have to work with what they’ve been given (a donation of cake ingredients please). So thankyou The Real Junk Food Project and Bristol Skipchen, you have restored my faith in human nature just when I’d given up hope, and you’ve inspired me. So yes, I will be returning there. Soon I hope and perhaps the other side of the counter. I will make cake. 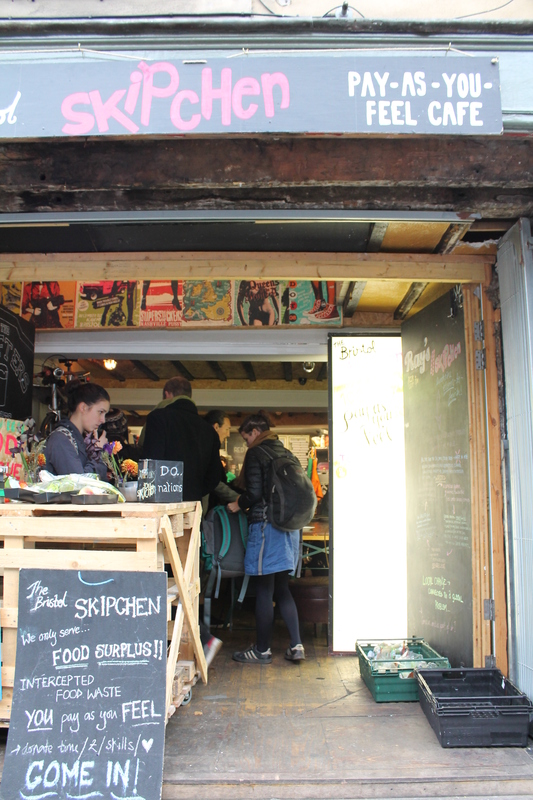 Bristol Skipchen is based in the Stokes Croft district of Bristol. Give them your support and your food donations and they will give you a delicious lunch.